What does it mean to create a home environment that supports listening? At first, it may seem obvious that a child who is deaf or hard of hearing needs a quieter space to listen. When we dig into the science behind environmental sound we start to understand why it’s so important for children with hearing loss to have full access to a spoken language without interruptions from noise inside their favorite learning environment, the home! Before we explain, it’s important to note that all children need a quiet listening environment to hear well enough to understand and learn. However, children with hearing loss have a greater need for clear access to language than their hearing friends. As adults, we tend to be more comfortable in our listening environments and can easily ignore ‘background noise.’ For this reason, parents may not be aware of the sounds in their home because they can easily tune them out. As you can see, normal conversation levels are somewhere between 50-65 dB at a distance of three feet. However, that same conversation decreases in clarity and intensity for a child who is deaf or hard of hearing when there are competing sounds present. Try to imagine your child’s experience when they’re trying to process language that’s mixed with sounds in the home that exceed the conversation loudness. With an optimal listening environment, your child can even overhear conversations directed towards others that also contribute to great LSL outcomes. 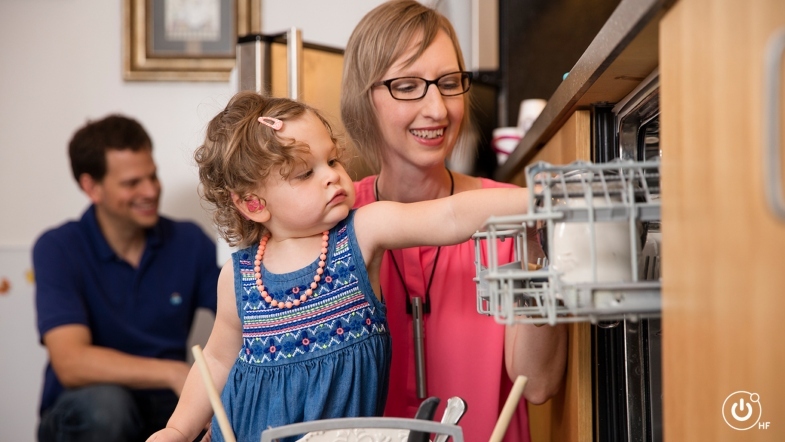 To help combat unnecessary noise, we’ve listed some quick tips to help you create an effective Listening and Spoken Language (LSL) environment in your home that will enable your child with hearing loss to hear clear language for learning! Remember, when it comes to creating a great listening environment in your home, the less noise the better. While you’re making sure they have an optimal listening environment in the home, your child is busy loving the ability to hear your voice loud and clear! Blog post originally appeared on the Hearing First blog, Getting to the Heart of Listening Around the House.